Parotidectomy is surgery to remove all or part of the parotid gland. These glands make saliva. They are located in the jaw, in front of and below each ear. 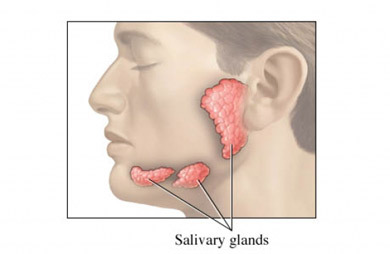 The parotid gland is the largest of the salivary glands. Saliva drainage—Saliva may pool in the upper neck after surgery. It may also drain through the incision after it has been closed. This is temporary. Frey’s syndrome—This happens when salivary nerve fibers grow into the sweat glands. While eating, some people may notice sweating on the side of the face where the surgery was done. Fistula—This is an abnormal connection between 2 structures. Tell your doctor about any medicine, herbs, or supplements you are taking. Some may need to be stopped up to 1 week before the surgery. Be sure that you have a ride to and from the hospital. A cut will be made in front of the ear and down into the neck. There are many nerves nearby. They will be located to decrease the risk of accidental damage. There are 2 types of parotidectomy surgery. The type you will have depends on why the surgery is being done. Superficial parotidectomy—just the tumor and damaged gland tissue are removed. Nerves are not affected. Can be used if the tumor is above the facial nerve. Total parotidectomy—tumor, damaged tissue, and part of nearby nerve are removed. May be needed if a tumor has grown into the nerve, the gland is infected or inflammed. After all tissue has been removed, the area will be closed with stitches. A drain will be placed behind your ear. It will allow fluids to drain from wound and help healing. Anesthesia will prevent pain during surgery. The area will be sore after the surgery. Medicine will help manage discomfort. You may be able to go home the same day. You may need to stay longer if there are any complications. Check your facial movements by asking you to smile or pout. Show you how to care for the drain. You will need to take it easy for the first few days. Certain actions like strenuous activity will need to be avoided. You will also need to follow care instructions for the drain. Chronic recurrent parotitis. EBSCO DynaMed website. Available at: https://www.dynamed.com/topics/dmp~AN~T293145/Chronic-recurrent-parotitis. Updated May 28, 2015. Accessed December 28, 2018. Salivary gland tumors. EBSCO DynaMed website. Available at: http://www.ebscohost.com/dynamed. Updated January 15, 2017. Accessed December 28, 2018. Parotidectomy. Memorial Sloan Ketterin Cancer Center website. Available at: https://www.mskcc.org/cancer-care/types/salivary-gland/salivary-gland-cancer-treatment/parotidectomy-parotid-gland-tumor-surgery. Accessed December 28, 2018.